When Hist Sap is licked by an Argonian, the tree is capable of communicating with the Argonian through visions. The sap of the Hist seems to increase the combat prowess of those who drink it. Hist sap has the ability to 'alter' living organisms, which may explain Argonian origins. 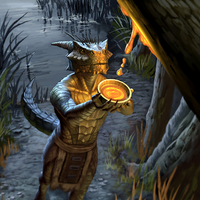 Ingesting large quantities of Hist-Sap is often dangerous, even for Argonians. The Sap-Speakers of the Miredancer Tribe, known for communing with their Hist and ingesting large amounts of sap in the process, often suffer the effects of sap-poisoning, including "gold tongue" (permanent change of mouth pigmentation to a golden hue), "bark scale" (thickening and darkening of surface scales), and unwanted hallucinations among other symptoms. The Blackwood Company smuggled a Hist tree from Black Marsh to their headquarters in Leyawiin, and extracted the sap to exploit this. However, when consumed by non-Argonian species, the Hist sap had strong hallucinogenic properties that sent them into dangerous bloodlust, though this particular Hist sap was modified to have similar effects on Argonians, as well. At the end of the Third Era, a recruit of the Fighters Guild sabotaged the Hist extraction mechanism, destroying the tree in the process. This page was last modified on 10 February 2019, at 11:47.